Did you know that every artist in our gallery is a friend? Many of them have been friends for more than 20 years and others have become friends over the last 7. When you visit the gallery, we can tell you about each artist’s life. It’s been a while since I have said this but I think it is important to remember. Each piece of pottery, jewelry, painting, or glass, has many years of training, experimenting, trial and error to arrive at the piece of artwork in front of you. Our artists aren’t hobbyists. This is their lives. Emma Baty, my summer intern, writes today about Polly Wellford’s pottery. Polly LOVES to make pots on the potter’s wheel. I have been jealous for years of her feelings for the wheel. I like throwing on the potter’s wheel but I also love hand building, sculpting, changing clay bodies, and learning new techniques. I am ok with having many failures. It’s why I have C2C Gallery, so that my clay work can continue to be an exploration. Sorry, I ran off on another topic. We love showing Polly’s pots to our customers. They are both lovely and functional. Always well crafted. Patterns and designs color Polly Wellford’s practical pottery. Polly’s inspiration comes from finding the inward significance of her works. With earthy greens and blues, Polly creates pieces that are functional for everyday in the home and kitchen, and her goal is to make pottery that “honors our daily life.” Balance is a primary goal while she works, and she uses patterns and designs to accomplish that. 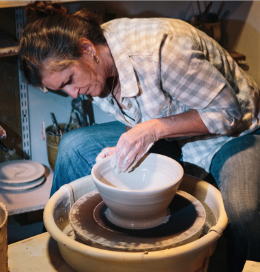 She studied with British potters, so her work has a flavor from across the pond. Her pots are lined with vertical patterns that almost look like strands of beads. Other pots feature leaves or flowers. 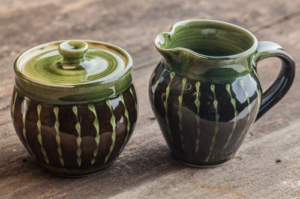 All of her pots “add beauty to a world often stressful, complicated and fast paced.” From coffee mugs to serving dishes and vases, Polly has a wide variety of options for any home. After multiple life-changing experiences, she decided to abandon her “real” job and pursue her creative endeavors. She hopes her work will have meaning beyond her own need for creativity and inner peace. “Make what you love to make and don’t worry about what people like and what they won’t like. If you do, your pots won’t be yours.” This quote and simplicity, balance and grace are what guide all of Polly’s work. Stop into the gallery and see for yourself.